Via the TUC Blog, this chart from the IMF is worth studying. 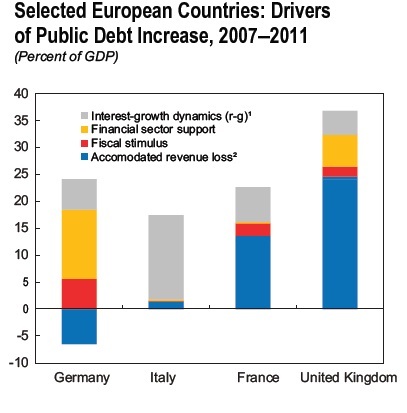 It shows the sources of public debt in Europe since 2007 for Germany, Italy, France, and the UK. You will notice that: yes, Virginia, the Germans bailed out the banks. Also, the Germans carried out the biggest discretionary fiscal stimulus in Europe at 5% of GDP. In all, German public debt increased as a percentage of GDP by more than Italy or France’s and second only to the UK’s. Also, Italy’s problems are entirely to do with growth or else with interest rates. And it looks like the political ability to pull in taxes is pretty important (something Daniel Davies pointed out not so long ago). This entry was posted in A Fistful Of Euros, Economics, Germany by Alex Harrowell. Bookmark the permalink. Someone needed to do some stimulus. Real stimulus. Keynes warned that not everyone could decide to save at the same time. Did anyone tell the guys who decided the euro was a good idea? In fact there is no stimulus. There is another graph in the IMF Regional Outlook : Europe report immediately to the right of the one published here that shows Germany did no stimulus in net terms. But one can easily see it in the published graph, too. The “accommodated revenue loss” is a gain for Germany, so it nets out with the fiscal stimulus. George: the chart is perfectly consistent with the Germans dropping a 5% GDP boost, then taking it back out in 2010. Crass Keynesianism!